Shield Insert Only, Backpack NOT Included TuffyPacks manufactures a global defensive solution to the ever increasing problem of active shooter incidents that are occurring at an alarming rate. We manufacture a custom insert that will provide a level of personal protection from ballistic threats similar to what law enforcement officers wear daily as bullet proof vests. 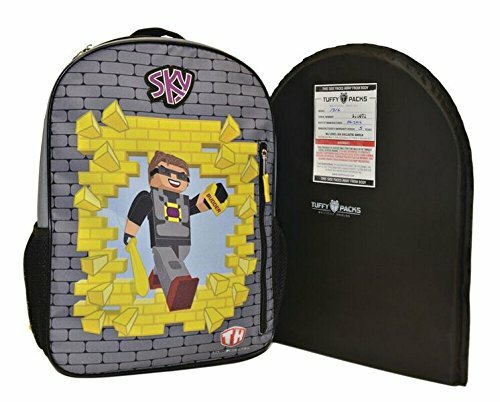 Our ballistic shields when inserted into backpacks, briefcases or computer bags will stop what is referred to as a Level IIIa threat. Level IIIa body armor provides the highest level of protection currently available as lightweight concealable body armor. Backpacks with our ballistic protection weigh only 16 - 24 ounces more than a non-protected pack (based on the pack size). Additionally, our ballistic shields are removable when the user desires to use the pack in a low or non-threat environment. Tuffy Packs ballistic backpack shields will protect the user against most all handgun and semi-automatic rounds up to and including 44 Magnums. Our ballistic shields are the large enough to protect your vital organs similar the vests worn by police officers. We offer 12" x 16" of protection in our most popular panel (1216C). That's over 190 sq. inches of defense. Every . TuffyPacks bulletproof shields are constructed from a high performance polyethylene fiber that is sewn into a fabric. We are able to create an ultra-thin, lightweight, flexible and concealable shield that can be used in backpacks, briefcases or other personal carry items. By layering our ballistic material we are able to achieve various levels of threat protection. A durable washable outer nylon sleeve is then sewn over the material to complete the panel. Our "Parents Guide" is especially helpful in addressing the reason why Mom and Dad put the panel in the school backpack as well as how to teach kids to use the backpack should the need arise. Lightweight, Flexible, Removable Level IIIA Ballistic Protection. If you have any questions about this product by TuffyPacks, contact us by completing and submitting the form below. If you are looking for a specif part number, please include it with your message.